Mickey's Mix Magic, the new nighttime show created for the 90th anniversary celebration for Mickey and Minnie, debuted last Friday night on Main Street, U.S.A. 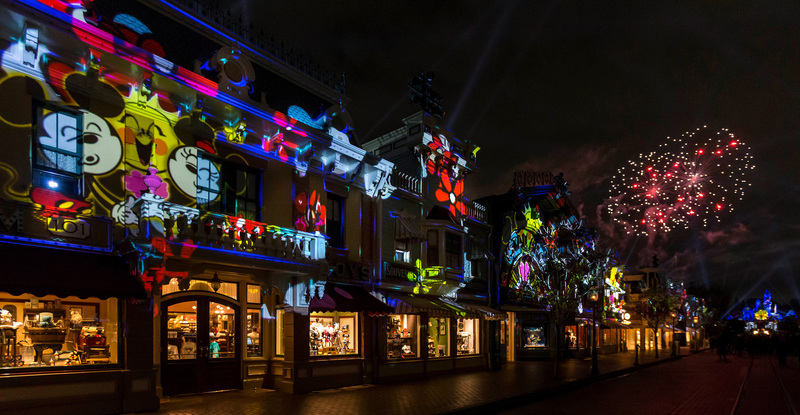 Billed as a "high-energy projection show," Mickey's Mix Magic is a 10-minute mashup of projected animation, light effects and electronic dance arrangements of popular Disney songs. Mickey's Mix Magic depicts Mickey and friends in the same style as the newer Mickey Mouse cartoon shorts. Photo © Disney. Main Street provides a larger canvas for Mickey's Mix Magic, as well as viewing of fireworks on select nights. Photo © Disney. As we expected based on concept art, the show relies heavily on the projectors previously installed around Disneyland park to project animation on the buildings of Main Street, U.S.A., on Sleeping Beauty Castle, on the Fantasmic show set and mist screens, and on the facade of "it's a small world." Much of the animation is original to this show, with Mickey and friends presented in the style Disney Television Animation has used for the Mickey Mouse cartoon shorts since 2015. Characters from The Jungle Book, The Aristocats, Aladdin, Coco, and Frozen dance across the scenes like part of an animated kaleidoscope. Mickey's Mix Magic begins and ends with "It’s a Good Time," a new song created especially for “World’s Biggest Mouse Party," Disney's celebration of 90 years of Mickey Mouse and Minnie Mouse. "DJ Mickey" acts as host of the party, and is shown spinning records throughout the show. Mickey's Mix Magic includes classics like "The Jungle Book" and modern films like Coco. Photo © Disney. "it's a small world" offers a different viewing option, with a wide projection surface and fireworks in the background. Photo © Disney. With Sleeping Beauty Castle currently under wraps for refurbishment, and Fantasmic about to go on winter hiatus, Main Street and the area in front of "it's a small world" provide the best viewing for the new show. Each location has its own unique presentation and special effects. On Main Street, the projected show is repeated up and down the street, with several buildings serving as a focal point. The Main Street location also makes use of snow blowers and laser effects to add to the show. "it's a small world" offers a different viewing experience, with the animation reworked to fit the single projection surface. Snow blowers were not used in this location during a media preview, and we do not know if they are part of the usual show. On nights when fireworks are presented, you can also get a view of them from this location. Disney advertises that the show will include fireworks on select nights, but at this time there is still no way to know in advance if fireworks are planned that evening. Disney says the online entertainment calendar should indicate which nights are scheduled to include them. Until that change happens, we still expect the 9:30 p.m. shows on Friday, Saturday and Sunday nights will likely include the pyrotechnics, where the 7:30 p.m. and 8:30 p.m. performances on weeknights might not. Mickey's Mix Magic is definitely a show for a specific audience, and not all Disney fans find it to be their cup of tea. The combination of updated Disney characters and dance club music appeals to some visitors, but the show lacks the storyline of recent fireworks shows. Of course, this is not intended to be a fireworks show, and it seems Disney is hoping audiences respond well to a nighttime spectacular that is light on pyro. While "Get Your Ears On" is Disney's official name for this anniversary promotion, "Get Your Eats On" is just as appropriate. Disney's chefs and menu planners have created no fewer than 90 different items to be released over the next few months, with treats in both theme parks and two of the resort hotels. To help keep track of the must-try dishes, you can pick up a printed Get Your Ears On food guide, which provides listings, locations and photos for many of the treats. The guides are also available online to assist you with planning your visits in advance—click here for the guides for Disneyland park and Disney California Adventure park. With 90 items on offer, we can't review them all in this space, and some are just variations of items—candy apples and churros—already sold in the park. But there are some new and novel creations to be found, and we had the opportunity to sample some last week. 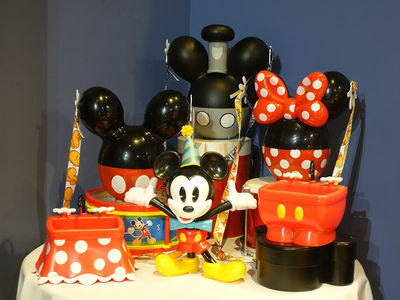 Disney's pastry chefs have a lot of fun with macarons, and the new Party Hat version has to be their most interesting. The light blue cookie is piped with cotton candy-flavored cream and filled with a mixture of candy sprinkles, including pop rocks. The treat is almost like a piñata, as the candy falls out as soon as you break the shell. Be sure to eat this one over a plate. While sweet treats seem to dominate these food lists, there are quite a few savory creations on the 90th anniversary menu. The award for most photogenic goes to the Share Your Ears burger from Smoke Jumpers Grill in Disney California Adventure. 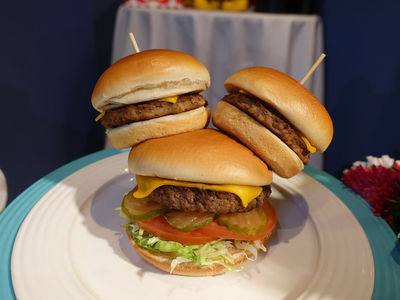 This is a 1/3-pound cheeseburger topped with two cheeseburger sliders as "ears." The Share Your Ears cheeseburger is designed for sharing, both with your dining companions and with all of your social media friends. Photo by Adrienne Vincent-Phoenix. Another designed-for-Instagram dish is the Pad Thai Spring Roll from Bengal BBQ in Disneyland. It's served chilled with a peanut dipping sauce, and has an artfully arranged hidden Mickey inside the wrapper. 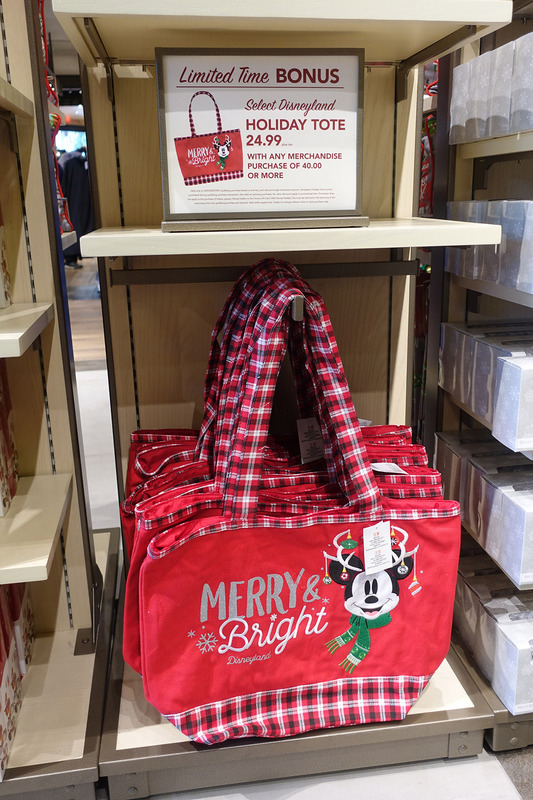 Last November, collectors waited in line for hours to get their hands on a souvenir Mickey Mouse sipper cup, which Disney said would be available just one day. Well, that cup returned for the Get Your Ears On celebration, and is available for $24.99 at more than a dozen locations around Disneyland and Disney California Adventure. The next hot food collectible will arrive in February, when Disneyland releases Mickey, Minnie, and Steamboat Willie popcorn buckets. The Steamboat Willie design will be available only to Disneyland annual passholders. No pricing was available at press time, but we expect them to run $25 or so. A handful of new food and returning food souvenirs are part of the Get Your Ears On promotion, including three new popcorn buckets. Photo by Adrienne Vincent-Phoenix. 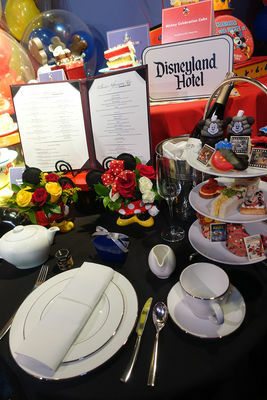 The Disneyland Hotel has updated its Classic Afternoon Tea with a new Mickey's Tea Party Celebration menu. Available through March 31, the new menu features a Mickey Mouse take on everything from salad to dessert. Reservations are available Fridays, Saturdays and Sundays, and every Thursday in March from noon to 3:00 p.m. View the new menu and check dining availability at the Disneyland website. Mickey and Minnie provide the inspiration for Mickey's Tea Party Celebration at Steakhouse 55. Photo by Adrienne Vincent-Phoenix. Love is in the air at Disneyland, where Valentine's Day will be celebrated for an entire month in 2019. 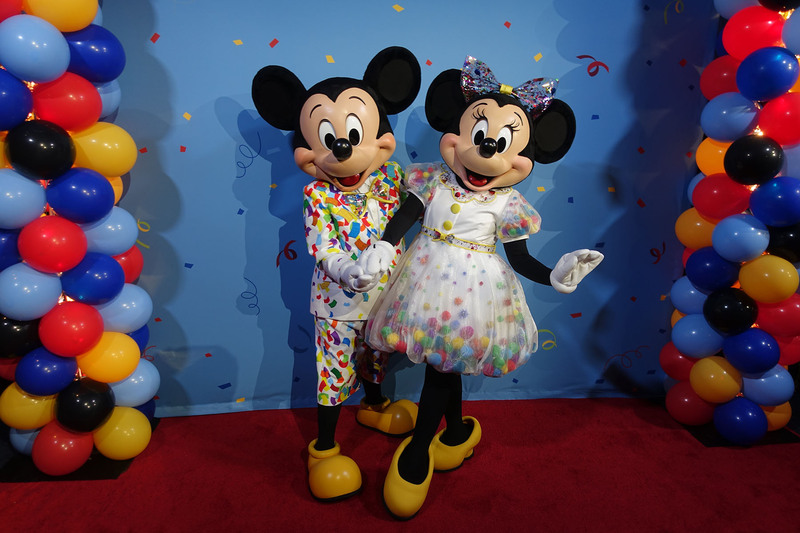 With Mickey and Minnie already the stars of the Get Your Ears On celebration, it's natural that they are also the focus of the Valentine's month promotion. Mickey and Minnie model their Get Your Ears On outfits. Photo by Adrienne Vincent-Phoenix. Flowers are traditional Valentine's Day gifts, so it's fitting that the floral Mickey Mouse planter at Disneyland's main entrance will get a makeover for the month. 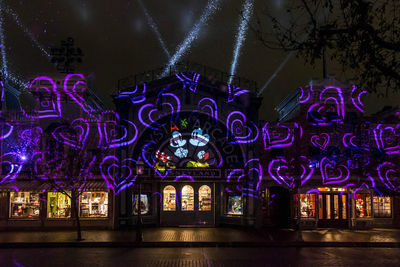 Main Street, U.S.A. will feature additional Valentine's Day decor and photo opportunities. New this year is Minnie's Valentine's Day Surprise Scavenger Hunt Experience. A twist on the popular Easter promotions, this hunt sends participants around Disneyland in search of Valentine's cards Minnie Mouse placed around the park. The experience costs $6.99 for the game board and stickers. Once you've found all of the Valentines, redeem your completed board to receive a special surprise. 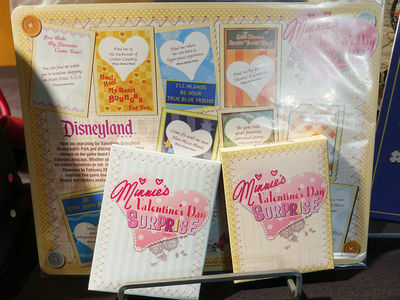 Minnie's Valentine's Day Surprise is a new scavenger hunt around Disneyland. Photo by Adrienne Vincent-Phoenix. As mentioned above, the Classic Afternoon Tea at Disneyland's Steakhouse 55 has a new Mickey Mouse theme as part of the Get Your Ears On promotion, but from February 8–17, the restaurant will host a special Valentine's tea with additional sweetheart treats. Reservations are available Fridays, Saturdays and Sundays—check dining availability at the Disneyland website. 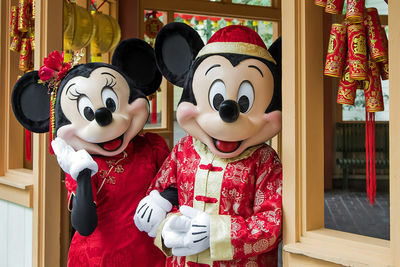 Disney California Adventure will celebrate the Year of the Pig starting this Friday with a Lunar New Year festival. A highlight of the 24-day celebration is the return of the popular “Mulan’s Lunar New Year Procession,” which this year features a rare appearance by Disney's Three Little Pigs in holiday attire. Goofy, and Chip and Dale also join the procession in their seasonal costumes. Mickey and Minnie pose for photos in their New Year attire at Disney California Adventure. Photo © Disney. At Paradise Gardens Park, Mickey, Minnie, Mulan, Mushu, and Pluto will rotate through a Lunar New Year meet-and-greet photo opportunity. The Paradise Gardens area will also feature craft stations, Lunar New Year photo spots, live music, and the return of the Lucky Wishing Wall. In addition to the seasonal menu offered at the Paradise Gardens Grill, there will be four marketplace booths featuring a variety of Asian-inspired dishes. Look for the Longevity Noodle Co., the Lucky 8 Lantern, Prosperity Bao & Buns, and the Red Dragon Spice Traders. New this year, Disney has created a Sip and Savor Pass especially for the four Asian Marketplaces. With so much attention focused on the Get Your Ears On promotion, it's easy to forget that the 2019 Disney Food & Wine Festival is just six weeks away. In fact, reservations opened last week for seven premium Festival events, including tasting seminars, cooking demonstrations, Sweet Sundays and the signature Dinner with the Disney Chefs event. We've listed the main events below, and you can check the event website for seminar details and availability. Dinner with the Disney Chefs (click here to book) – $314 per person, including tax & tip. Thursday, March 28, 6:30 – 9:00 p.m. Celebrate the release of the new Disney Festivals cookbook and enjoy a four-course meal prepared by three of the featured Disney chefs, Culinary Director Chef John State, Chef de Cuisine Jimmy Weita, and Executive Pastry Chef Jean-Marc Viallet, with a delightfully-paired beverage menu curated by Disney Sommelier Jeannie Villarreal-Bissell. The chefs will be available following the event to sign purchased copies of the cookbook. A limited quantity of the Disney Festivals Cookbook will be available for purchase at the event. ...Our partners at Get Away Today tell us Disneyland no longer offers advance purchase vouchers for Character Dining. Reservations can still be made 60 days in advance with payment due at the restaurant. Astro Orbitor – closed for refurbishment. No reopening date announced, but after March 3. Sleeping Beauty Castle Walkthrough – close3 January 17 for refurbishment. No reopening date announced, but after March 3. Fantasmic – closed for refurbishment January 21 to mid-March. "it's a small world" – closes January 22–31 to remove the holiday overlay. Sailing Ship Columbia – closes January 22 for refurbishment. No reopening date announced, but after March 3. Splash Mountain – closed February 4–14 for refurbishment. Space Mountain – closes February 25 for refurbishment. No reopening date announced, but after March 3. World of Color – closed for refurbishment. The show was scheduled to return on June 22, but Disney has announced an "extended refurbishment" for the show. No reopening date announced. Grizzly River Run – closed for refurbishment. No reopening date announced, but after March 3. Golden Zephyr – closed January 27 to February 2 for refurbishment. Tangaroa Terrace (Disneyland Hotel) – closed for refurbishment through January 26. 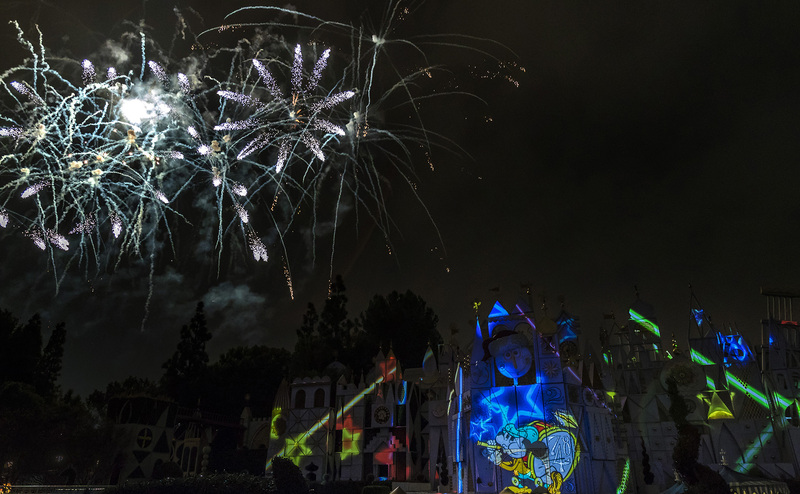 Moonlight Magic at Disneyland – Thursday, January 31. This exclusive event for DVC members is sold out. 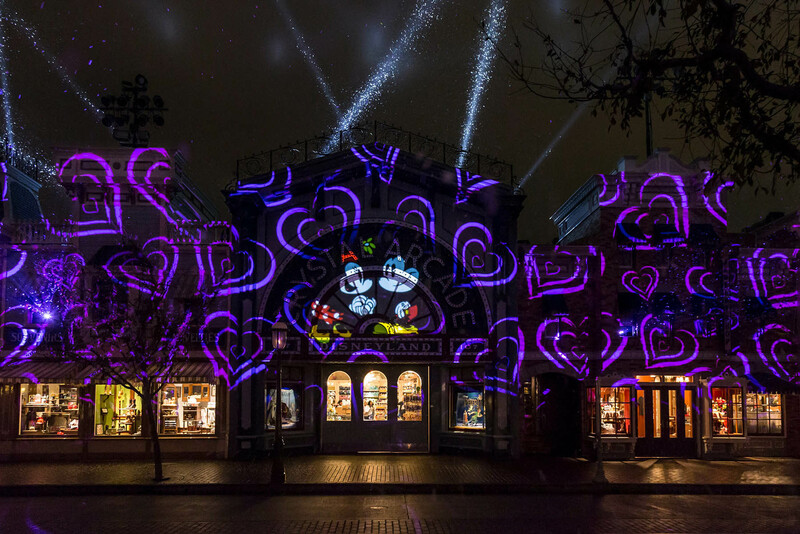 Disneyland After Dark: Sweethearts Nite – Thursday, February 7. This event is sold out. Lunar New Year celebration at Disney California Adventure – January 25 to February 17. Disneyland After Dark: 90s Nite – Thursday, March 6. This event is sold out. *The Limited-Time Special Ticket Offer is valid for travel January 7 - May 23, 2019, excluding the spring break blockout of April 14 - 22, 2019. The price is the same for all ages 3 and older, and each ticket includes one Magic Morning entry. Tickets must be purchased by May 18, 2019. You must use all entries within 13 days of the initial entry. +The Limited-Time Southern California Resident is valid for travel January 7 - May 23, 2019, excluding the spring break blockout of April 14 - 22, 2019. The price is the same for all ages 3 and older, and each ticket includes one Magic Morning entry. Tickets must be purchased by May 20, 2019. There is no fuse on this ticket. The current purchase-with-purchase offer is a holiday tote for $25 with any $40 merchandise purchase. +The Limited-Time Southern California Resident is valid for travel January 7 - May 23, 2019, excluding the spring break blockout of April 14 - 22, 2019. The price is the same for all ages 3 and older, and each ticket includes one Magic Morning entry when purchased in advance of the visit. Tickets must be purchased by May 20, 2019. There is no fuse on this ticket. Disneyland tickets may be used through December 18, 2019, excluding the spring break blockout of April 14 - 22, 2019. Disney 3-Day or 4-Day Military Promotional Tickets for admission to the Disneyland Resort expire and may not be used after December 19, 2018. Valid military identification will be required for purchase and use. Year of the Pig celebrations and they didn't center on Miss Piggy? Sigh.